When we decided to buy new living room furniture, we needed something that looked good, was durable for our growing children and could be a sleeper sofa. We had heard of the LoveSac company years ago and luckily a store appeared in our local mall so we went in. For those not familiar with LoveSac, they are basically bean bag chairs, but not made from beans and WAY more comfortable. It turns out they also make sectional sofas, which are called Sactionals, and are completely customizable to whatever shape your room needs. Sometimes we have a long couch, a chair and ottoman; sometimes an L-shaped couch and chair; sometimes a king sized bed. 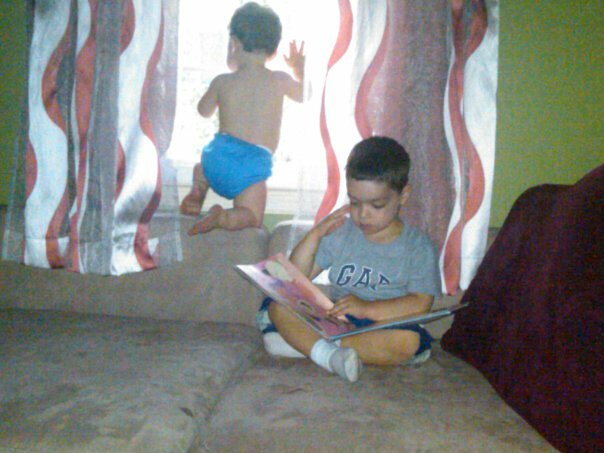 So my 4 year old is reading a book and the 1 year old is pushing his physical limits and trying to escape out the window. Given their own, unique space and my boys chose how to use the space to fit their individual needs. Sometimes they play together and jump around on the couch, sometimes they just sit and play individually. But, when we were all forced to share the same space, there was always someone who was bumped out and was unhappy. Well, seeing this picture I started thinking about my classroom. In a traditional setting, we force every student to work in the same space, in the same style which means that someone is always unhappy. But, if we think outside the box, allow students to use computers during a lesson so they can research answers to their questions, and let them move around the room to a place they are the most comfortable when learning and even studying a topic they are more interested in will give them a greater sense of enjoyment out of the class. Can I fill my room with Sactionals? Of course not (a little to my dismay). But, can I give my students a proper learning environment that allows for the growth of their individual needs? Absolutely! This entry was posted in Learning environment, learning needs, LoveSac, Sactionals on August 8, 2011 by DaretoChem. high in quality. The sacionals are perfect alternative furniture chairs.